Blaine Elementary Principal Troy LaRaviere. 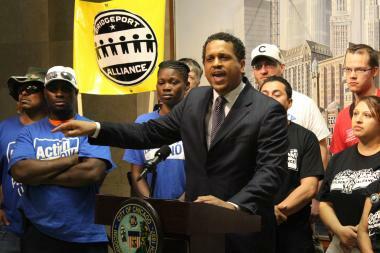 LAKEVIEW — Troy LaRaviere isn't backing down. He said as much in the days after a formal warning from the Chicago Board of Education, which threatened to fire the Blaine Elementary School principal for "insubordination" tied to his support of PTA efforts against spring standardized testing and retorts during a July 13 budget meeting. "I love the work I do. I certainly would like to keep doing it, but that will not be at the expense of lowering my head to incompetence and injustice and turning a blind eye," LaRaviere told DNAinfo Chicago on Friday. Dozens of parents, educators and onlookers voiced support on LaRaviere's blog and social media over the weekend. Even talk show host Montel Williams stood behind LaRaviere. Blaine Elementary School, 1420 W. Grace St., on Monday. One parent said LaRaviere was already complying with a directive from CPS to conduct himself as a role model to students by taking a stand. "He makes me proud that my children get to witness that kind of courage. What a brave man," Scott Weisenberg said. Since news broke of his warning, LaRaviere said he's been "encouraged" by responses from parents and others in the Blaine community. Rather than become the face of a movement, LaRaviere said he wanted to focus on being a principal and helping students, but would not stay silent in exchange. "It's only someone who has an indefensible stance that does not want it to be criticized. If your stance is a just one — a competent one — then you would have no problem defending it," LaRaviere said. Still, some worry LaRaviere's rising star could overshadow his work at Blaine Elementary, while others say if LaRaviere doesn't like how CPS does business, he should leave. "When your loyalties are conflicting, the stress is reduced by joining an organization you do believe in. He should resign his position — then he would be free to ethically speak his mind," one person wrote in a Facebook discussion. During April elections, LaRaviere publicly supported mayoral challenger Jesus "Chuy" Garcia, slamming Mayor Rahm Emanuel and CPS. As LaRaviere took on an advisory role on Garcia's team, some parents said they felt LaRaviere prioritized his own agenda over students' needs. "It seems like a lot of what he does is just agenda-driven, based on his political aspirations. He purports to look out for the interests of children, but the time, place and manner in which he does it detracts from the message," one Blaine father told DNAinfo on Monday. With a first-grade Blaine student, the parent said he wished to remain anonymous to prevent any negative impact on his child. "Frankly, my reaction was that it's about time," the father said of the warning. While the Local School Council has backed LaRaviere for years, "maybe CPS will step up and take some actions to have him focus a little more on the day-to-day functioning of the school," he said. 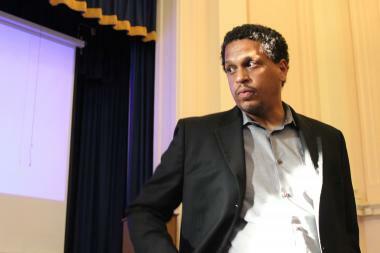 The head of the PTA, though, has no concerns about LaRaviere's balancing act. "He's pretty good at compartmentalizing those parts of his life. They do overlap here and there, but as far as affecting his effectiveness as a principal, I don't think there's any negative impact there," PTA President Melissa Bullock said. The PTA was thrilled with LaRaviere's support of their attempt at a school-wide opt-out to Partnership for Assessment of Readiness for College and Careers testing in the spring. The principal "made it a lot easier and provided a respectful environment of what we were trying to accomplish," Bullock said. While the Blaine father said he agreed with some of LaRaviere's opinions, he felt the PTA came on too strongly when it came to the test. "I was extremely upset when my children were going to school and had PTA members pushing paper at them trying to get them to opt out of this test, which I thought was a crucial thing" to prepare them for high school entrance exams, he said. Last week, the board signed off on a warning resolution admonishing LaRaviere for his vocal opposition of PARCC testing and defiant stance against recent CPS budget and operational decisions. 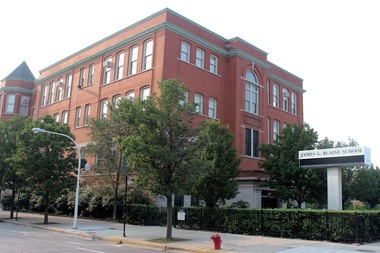 Despite rising test scores at Blaine, the warning demands LaRaviere fall in line with CPS directives and not "publicly take a stance" against the school system, CEO Forrest Claypool or his administrators. LaRaviere was given a chance to respond to the warning before the board voted. The principal said he had one day's notice of the meeting, but he had a conflict. Both he and board vice president Jesse Ruiz were scheduled to speak at a City Club Chicago panel centered on CPS and its financial woes.